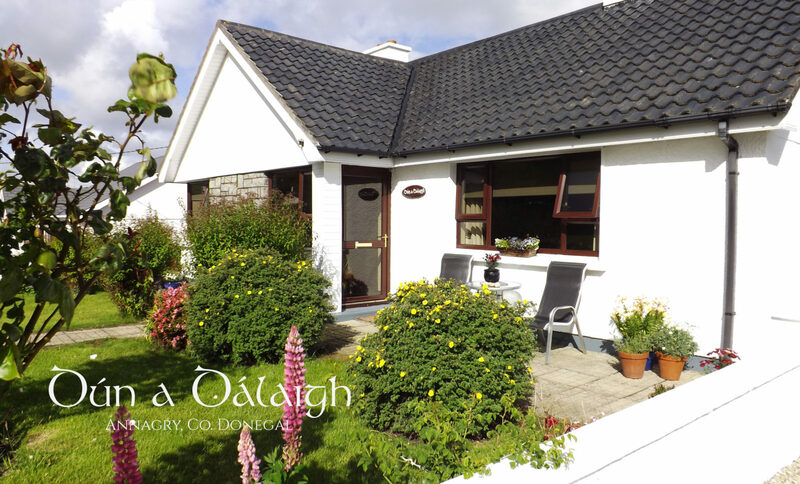 Dún a dálaigh house is situated in the heart of the village of Annagry, Co. Donegal on the Wild Atlantic Way. It is within walking distance from all amenities including shops, pubs and 2 Award Winning restaurants (Danny Minnie's & Caislean Óir). The house is 5 minutes drive from Carrickfinn blue flag beach and 20 minutes drive from Glenveagh National Park. This lovely Annagry cottage is guaranteed to delight and charm holidaymakers with modern conveniences all of which combine to create a cosy and homely environment. Dún a dálaigh offers guests a pleasant and comfortable stay. Relax with loved ones in the spacious garden or in front of our turf fire before taking a short stroll (approx 1 minute) to one of our local Award winning Restaurants. Activities which can be arranged locally include Golfing, Surfing, Canoeing, Kayaking, Diving, Fishing, Sightseeing cruises, Island trips (Aranmore, Owey and Gola), Cycling, Walking and Horse-riding all adding to a holiday you will never forget. We have lots of entertainment to offer in the village of Annagry with traditional Irish music in Sharkey's Bar and Caislean Oir regularly, both walking distance from Dún a Dálaigh. Leo's Tavern, home of Enya, Clannad and Moya Brennan is less than a 5 minute drive away.